Inquire NOW for Fall 2019! 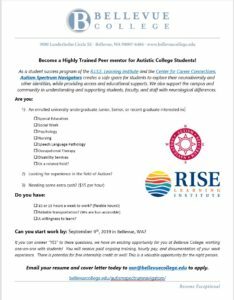 Are you: an enrolled University Undergraduate Junior or Senior (or recent graduate) with an interest in: Disability Services; Psychology; Nursing; Speech Language Pathology; Occupational Therapy; Special Education, or a related field? And are you: Looking for experience in the field of Disability Services or Autism? Do you need some extra cash ($15 per hour)? Do you have: 10-15 hours a week to work (flexible hours!) and reliable transportation? (we’re bus-accessible), and a willingness to learn? Can you start work by September 9, 2019 in Bellevue, WA? If you can answer “YES” to these questions, we have an exciting opportunity for you at Bellevue College, working one-on-one with students! You will receive paid ongoing training, hourly pay, and documentation of your work experience. There is potential for internship credit as well, depending on agreements with your University (fees may apply). This is a valuable opportunity for the right person. Email your cover letter and resume to asn@bellevuecollege.edu today to apply or for more information. Download the Jobs Flyer. We are looking for the right candidate to support our ongoing research efforts through the R.I.S.E. Learning Institute. If you are a Masters’ candidate seeking to make a meaningful contribution while completing your degree, please contact us for more information.